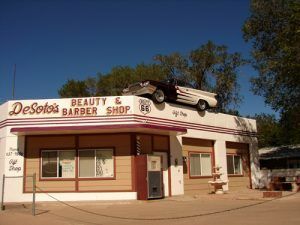 West of Williams, Arizona, about 17 miles along the pavement of Route 66, is the small town of Ash Fork — population about 500. Ash Fork got its start when the Atlantic and Pacific Railroad, later known as the Santa Fe Railroad, pushed through in October, 1882. Originally established as only a railroad siding, it was named by F.W. Smith, General Superintendent of the railroad, for the many ash trees growing on the town site. However, long before the railroad arrived, the area had been roamed by Native Americans, as evidenced by numerous pottery shards and arrowheads found in the area, as well as pictorial writings on rock. The Spanish, in their search for the elusive Seven Cities of Cibola, came near the area in the late 1500’s. Though this “primitive” terrain had been crossed since the early 1800’s by fur trappers and traders on their way from Santa Fe, New Mexico to Los Angeles, California, the trails were in poor condition and the region was known to be wild, unexplored, and dangerous. From 1857 to 1860 Lieutenant Edward F. Beale, a crew of 100 men, and 22 camels built the first federal highway in the southwest — the Beale Wagon Road. Later highways, including Route 66, would be paved across portions of this historic trail. The same year that the railroad arrived — 1882, a man named Thomas Cooper Lewis opened the town’s first business. In April, 1883, Ash Fork gained its own post office, with Henry W. Kline serving as the first Postmaster and two years later, Wells Fargo opened an office. The arrival of the railroad also opened up the area to cattle and sheep ranching. The railroad also spearheaded the stone industry. Local flagstone was soon quarried for the railroad to build bridges and private industry began shipping stone for public buildings, churches and office buildings. 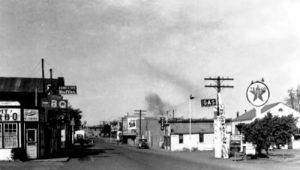 During its earliest days, Ash Fork, like many railroad towns across the region, was mostly called home to railroaders and cowboys, in a time where there was no “official” law and order. With so many rowdy men, chaos reigned supreme and as a result, several citizens in the small settlement organized a vigilance committee to get rid of them. Several are said to have been hanged from an Ash Tree. As the railroad became more popular, the Fred Harvey Escalante Hotel was built in 1907. Opening on March 1, 1907, it was built of steel and concrete in the Mission Style of Spanish architecture. The large hotel and restaurant were 420′ X 200′ and cost about $115,000. On the ground floor, it featured a lunch room fitted with a circular counter, complete with the ever popular Harvey Girls. It also sported a large curio shop, news stand/reading room, and a barber shop. 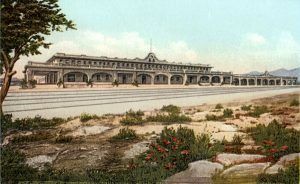 When Route 66 came through, the Fred Harvey Escalante Hotel and restaurant catered to both highway and railroad travelers. The new highway also brought a boost to the town’s economy; but, later, when the Mother Road received an upgrade to a divided highway, it resulted in the destruction of many of the storefronts, sidewalks, and residential streets. As automobile travel increased, the beautiful Escalante Hotel closed down in 1948. Not many years later, in 1960, the Santa Fe Railroad moved its main line north and away from Ash Fork, resulting in the town losing nearly half its population. Another large fire, known locally as the “Big Fire,” devastated the community on November 20, 1977, destroying most of the downtown businesses. At the same time, I-40 was being built, which closely followed Route 66, with the exception of the stretch between Ash Fork and Kingman, where Route 66 took a more northerly, less direct route. Bypassing the community, it was yet another blow to the local economy, which has never fully recovered. Unfortunately, it was during this time that the historic Escalante Hotel was demolished. Situated in the first Texaco station in Arizona, this structure on Lewis Avenue in Ash Fork now houses DeSoto’s Beauty & Barber Shop. The old Chrysler DeSoto, perched atop the building, dates back to the early 1960’s. Click for prints & products. Today; however, the small population continues, supported by five flagstone yards, ranching, mining, and a new generation of Route 66 travelers. The Mother Road through Ash Fork, continues to serve as as a main thoroughfare through town, now known as Park Avenue. A few historic buildings and some old railroad company houses can be seen along this old portion of pavement. This historic community features the Ash Fork Route 66 Museum, located at 901 W. Old Route 66, which displays not only Route 66 memorabilia, but, more exhibits and information on area history. There are also several photo opportunities to be found at Desoto’s Beauty, Barber and Gift Shop, located at 314 West Lewis Avenue, the Oasis Lounge at 424 Park Avenue, and the Ranch House Cafe at 111 W Park Avenue. Beyond Ash Fork, the longest stretch of unbroken Route 66 highway begins at Crookton Road. This historic pavement is approximately 92 miles long, meandering parallel to the Santa Fe Railroad bed. This old alignment provides numerous peeks of vintage Route 66 and is steeped in Native American, mining, and Old West. history.